Sudden sensorineural hearing loss (SNHL) is an emergency in otolaryngological practice. The exact cause, in most of the cases, cannot be found. A triad of vascular, viral and membrane rupture are the known theories for the causation of sudden SNHL. Now various autoimmune disorders have also been suggested to play a role in the pathogenesis. Autoimmune inner ear disease (AIED) is a relatively new etiological mechanism of sudden or rapidly progressive hearing loss, which has been added to the previously accepted triad of viral, vascular and membrane rupture. McCabe  was the first to describe AIED in 1979. He reported 18 patients with bilateral rapidly progressive SNHL for which no cause could be identified. Scleroderma, an autoimmune disease, also known as systemic sclerosis, is characterized by sclerotic skin changes that are often accompanied by multi-system disease. It targets fibroblasts and endothelial cells. Cutaneous manifestations usually include sclerodactyly, mat like telengectasias and Raynaud's phenomenon. Extracutaneous manifestations include audiovestibular dysfunction. Progressive fibrosis, resulting from increased deposition of collagen in the interstitium and intima of small arteries and connective tissue of involved organs is the pathologic hallmark of the disease. However scleroderma as the cause of sudden bilateral SNHL has not been reported much in English literature. Mrs P, 30-year-old female came to us with pain both ears and discharge left ear for the last 1 month. She developed sudden severe hearing loss 3 days back. She had taken medicines outside and developed rashes and patchy bluish discoloration of skin on the arms and finger tips and distal half of feet and toes both sides. She was diagnosed as a case of drug reaction by the dermatologist. She reported to us when she had severe deafness. On examination, right tympanic membrane was congested and bulging and left side had central perforation. Nose examination revealed crusting both nasal cavities. She had ulceration of the oral mucosa, dorsum, undersurface and sides of the tongue. 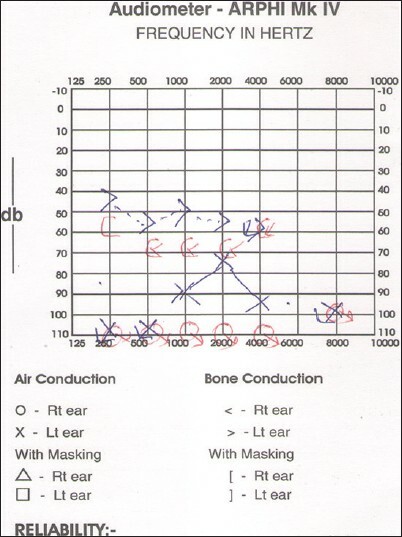 Pure tone audiogram [Figure 1] showed profound SNHL in the right ear and mixed hearing loss left side. After 4 days, gangrenous changes were noted in middle fingers of both hands and toes (Raynaud's Disease) [Figure 2]. Hematological examination showed leucocytosis with mild hypochromia and neutrophilia. Erythrocyte sedimentation rate, blood urea, serum creatinine were raised. Serum uric acid, HIV, hepatitis B virus surface antigen, HCV were normal. Rheumatoid arthritis (RA) factor-qualitative and quantitative (highly elevated) and C reactive proteins were positive. Urinalysis showed albuminuria and hematuria with 6-7 pus cells. Cytoplasmic antineutrophil cytoplasmic antibodies (C-ANCA) and anti-cyclic citrullinated peptide were positive, and anti-nuclear antibody was equivocal, whereas perinuclear-ANCA was negative. X-rays chest was clear. She was diagnosed as a case of disseminated scleroderma with sudden bilateral SNHL. On those lines, the patient was treated for bilateral sudden SNHL. Antibiotics, high doses of steroids, peripheral vasodilators, oral glycerin, and and local applications of nitroglycerine were administered. Autoimmune inner ear disease in human being is an uncommon, but a distinct clinical entity. Autoimmune inner ear disease is a relatively new etiological mechanism of sudden or rapidly progressive hearing loss, which has been added to the previously accepted triad of viral, vascular and membrane rupture. McCabe 1979 was the first to describe autoimmune inner ear disorder. The diagnosis of the inner ear autoimmune disorder depends mainly on relatively distinct clinical course, immunological investigations and treatment response. The clinical picture usually consists of bilateral SNHL, bilateral reduced vestibular loss and symptoms of pressure with tinnitus and rarely tissue destruction of middle and external ear. There is vasculitis, ghosts of blood vessels and granulomatous substrate in the temporal bone pathology in confirmed AIED. It is characterized by proliferative vascular lesion and marked deposition of collagen in various tissues and organs. Autoimmune disease that affects the inner ear may be either due to organ-specific disease or systemic disorder. Autoimmune disorders affecting inner ear has been classified into six types; organ-specific, rapidly progressive bilateral SNHL with systemic autoimmune disease, immune mediated Meniere's disease, rapidly progressive SNHL associated with inflammatory diseases such as chronic suppurative otitis media/otosyphilis, cogan syndrome and AIED-like. Veldman et al. reported autoimmune SNHL is due to immune induced vasculitis, a defect in polymorphonuclear leukocytes and post vaccination serum sickness. The various systemic autoimmune disorders affecting the ear/temporal bones are polyarteritis nodosa, cogan's syndrome, wegener granulomatosis, behcet's syndrome, relapsing perichondritis, systemic lupus erythematosus and RA. Probable organ-specific AIED includes tympanosclerosis, otosclerosis, otitis media with effusion, chronic suppurative otitis media with cholesteatoma and menier's disease. The clinical picture of AIED differs from other causes of severe SNHL in that it is usually rapidly progressive (over weeks to month) rather than sudden (hours to days), bilateral, asymmetric SNHL. Scleroderma is an aggressive, multistage autoimmune disorder, also known as systemic sclerosis with high mortality. It is characterized by sclerotic skin changes that are often accompanied by multi-system disease. It is an autoimmune disease that targets fibroblasts and endothelial cells. Progressive fibrosis, resulting from increased deposition of collagen in the interstitium and intima of small arteries and connective tissue of involved organs is the pathologic hallmark of the disease. Cutaneous manifestations include sclerodactyly, mat like telengectasias and raynauds phenomenon. Extracutaneous manifestations include audiovestibular dysfunction. There are 4-12 new cases per million per year, with a 3-4:1 female preponderance. The etiology and pathogenesis of scleroderma remains unknown and probably multifactorial, both cell and humoral mediated. The onset is usually preceded by Raynaud's phenomenon. Increased collagen production and vascular damage are potential explanations of hearing loss in scleroderma. The vascular supply to hair cells is fragile and easily disrupted. The prognosis depends upon the organ involved. Lungs, heart and kidney involvement can cause serious complications. Deroee et al. in their study have reported a case of sudden hearing loss as presenting symptom of systemic sclerosis. Taleb and Linthicum  described the histopathological finding in the temporal bone in a case of scleroderma. Etanercept is a drug that interfere with tumor necrosis factor-a soluble inflammatory cytokine, an Food and Drug Administration approved drug for autoimmune disorders is being used and have been found to have promising result to improve hearing and tinnitus. Azathioprin and Mycophenlate mofetil with predinisolone combination have also been advocated. Intratympanic injection of glucosteroids in the middle ear have been found to be better than oral or parenteral routes. Concentrations of steroids in perilymph through intratympanic route have been found to be higher when compared to oral or parenteral routes. Methylprednisolone is a better option since its level in endolymph have been found to be higher than hydrocortisone and dexamethasone. Plasmapheresis is another proposed mode of treatment. Circulating antibodies, antigens, and immune complexes are removed, which may enhance the effects of immunosuppresive agents. It is just like dialysis mainly advised in those patients who do not respond to steroids and cytotoxic drugs. Stem cell has become a promising tool in the treatment of autoimmune disease by promoting tissue repair and protection from immune-attack associated damage. Autoimmune inner ear disease is a relatively new etiological mechanism of sudden or rapidly progressive hearing loss which has been added to the previously accepted triad of viral, vascular and membrane rupture. It can be devastating to patients and frustrating for the otolaryngologist to diagnose and treat. The diagnosis is based on the presence of bilateral progressive or sudden asymmetrical SNHL and the response to immunosuppresive therapy. Treatment is more controversial. Steroids in high doses with or without cytotoxic agents have been advocated by various authors. Current ongoing investigations include the role of stem cell and helper T lymphocytes. In all cases of bilateral sudden sensorineural loss, AIED must be kept in mind as one of the cause, investigated and treated accordingly. 1. McCabe BF. Autoimmune sensorineural hearing loss. Ann Otol Rhinol Laryngol 1979;88:585-9. 2. Harris JP, Gopen Q, Keithley E. Autoimmune inner ear disease and other autoimmune diseases with inner ear involvement. In: James B. Snow Jr. and P. Ashley Wackym, editors. Ballengers Otolaryngology Head and Neck Surgery. 17 th ed. Centennial edition, MvGraw-Hill Medical; 2009. p. 305-12. 3. Veldman JE, Roord JJ, O′Connor AF, Shea JJ. Autoimmunity and inner ear disorders: An immune-complex mediated sensorineural hearing loss. Laryngoscope 1984;94:501-7. 4. Craig AE. Hearing what there is to say about scleroderma and the ear. Dermatology, June 2008. 5. Kastanioudakis I, Ziavra N, Politi EN, Exarchakos G, Drosos AA, Skevas A. Hearing loss in progressive systemic sclerosis patients: A comparative study. Otolaryngol Head Neck Surg 2001;124:522-5. 6. Monteiro TA, Christmann RB, Bonfá E, Bento RF, Novalo-Goto ES, Vasconcelos LG. Hearing loss in diffuse cutaneous systemic scleroderma. Scand J Rheumatol 2011;40:467-71. 7. Mogi G, Lim DJ, Watanabe N. Immunologic study on the inner ear. Immunoglobulins in perilymph. Arch Otolaryngol 1982;108:270-5. 8. Harris JP. Immunology of the inner ear: Response of the inner ear to antigen challenge. Otolaryngol Head Neck Surg 1983;91:18-32. 9. Deroee AF, Huang TC, Morita N, Hojjati M. Sudden hearing loss as the presenting symptom of systemic sclerosis. Otol Neurotol 2009;30:277-9. 10. Abou-Taleb A, Linthicum FH Jr. Scleroderma and hearing loss: (Histopathology of a case). J Laryngol Otol 1987;101:656-62. 11. Rahman MU, Poe DS, Choi HK. Etanercept therapy for immune-mediated cochleovestibular disorders: Preliminary results in a pilot study. Otol Neurotol 2001;22:619-24. 12. Parnes LS, Sun AH, Freeman DJ. Corticosteroid pharmacokinetics in the inner ear fluids: An animal study followed by clinical application. Laryngoscope 1999;109:1-17. 13. Luetje CM. Theoretical and practical implications for plasmapheresis in autoimmune inner ear disease. Laryngoscope 1989;99:1137-46.